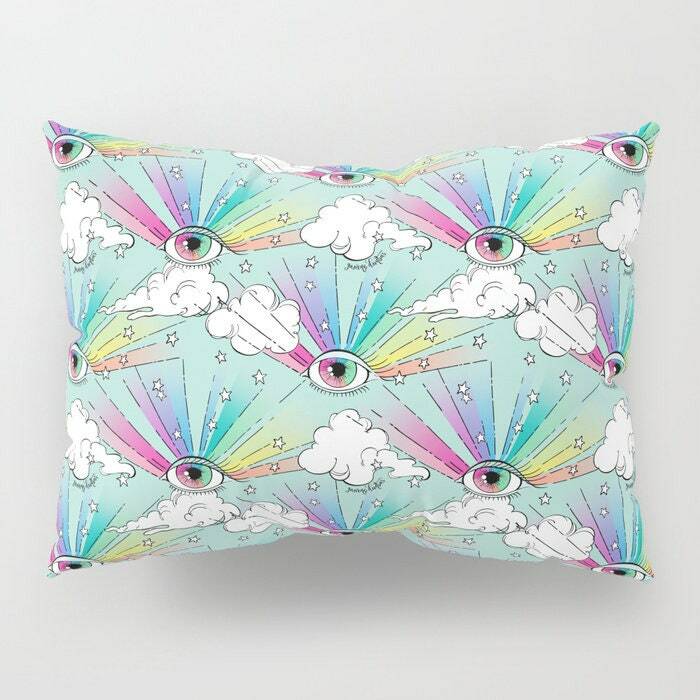 Esoteric and dreamy, my ray-bow eyes are a fun pop of print for perfect bedroom! Be sure to accessorize the look with matching pillows and curtain panels. All orders are returnable for a full refund minus shipping. Please review Refunds and Exchanges. Be sure to inspect all deliveries thoroughly upon arrival. I typically add on a confirmation from the post office for my own tracking and if the amount allows I do ship priority. If there is any damage due to shipping, please contact me so we can resolve it. I hope you will be happy with your purchase. If you are not, please convo me within 3 days of delivery to begin process of your return. Your return must be accompanied by the original receipt (or a copy). I will issue you a refund on your return. However, original shipping and handling charges are non-refundable. Returns need be well-packed and insured for the full price of the item. Please contact me for the return shipping address. PLEASE NOTE: All pieces are created by hand, so no two items are identical. That’s the beauty of the product! Please allow for slight variances from what is shown in the photos. If you have questions regarding custom orders, please feel free to contact me. Although because of quantities, I can't make any guarantees regarding fulfillment, I will be more than happy to try and accommodate where possible. Please also remember that all original images are copyrighted and purchase of an image does not transfer the rights. Hairpik is the tag of Janene Dunbar. The Hairpik and Cartoon Boyfriend logos in addition to all surface designs are owned and copyright by Janene Dunbar. I love bloggers and online publications that wish to show my work! If you decide to utilize any of my images, I would appreciate credit and a link to the post so I can also provide credit and a link back to you as well! Thanks!